Military Movies Trivia - In honor of Veterans Days! War is all hell, but movies about it have captured our imaginations since film began. The very first movie to ever win the Academy Award for Best Picture was a war movie, and we’ve never looked back since. War movies give us insight into the human condition, into people dealing with the most difficult circumstances imaginable and overcoming them (or sometimes, very much NOT overcoming them). But how much do you actually know about these classic (and in some cases, not so classic) movies? To thank everyone who has serve or is serving we would like to pay respect with Veterans Day on November 11 with an entire theme trivia night to Military Movies on November 6th. Free to play! Hosted by KZone, 8pm start! Prizes to 1st, 2nd and 3rd Place Teams! Email basecampmarketing1@gmail.com to reserve your table. Friends Trivia ! Happy Friends-giving! With Thanksgiving Just around the corner we would like to celebrate with all our FRIENDS! Phoebe, Joey, Monica, Ross, Chandler and Rachel are still as popular as ever and the show is in constant syndication around the world. The sextet are constantly being asked about a possible reunion but to still no avail. Someone needs to offer them enough money so they can’t say no! Yet, Friends is so ingrained in popular culture that sometimes we forget the smallest of details. Come out and try our Friends trivia night! Free to play! Hosted by KZone! 8pm start. Email basecampmarketing1@gmail.comto reserved your table! NL’s Christmas Vacation! Ugly Christmas Sweater Party! Who cares about the Kardashians when you can keep up with the Griswolds? With such a chaotic holiday season approaching us we want to celebrate with all of you with a theme trivia of a classic Holiday Movie — NL’s Christmas Vacation! Dress in your Ugliest Christmas Sweater and receive a free shot from us!! Elf Trivia- A Merry Christmas To All, Onesie Party! If smiling’s your favorite, you’re going to love this holiday treat: Elf Trivia! Join us December 18th, hosted by KZone, 8pm start. Free to Play! Prizes to 1st, 2nd and 3rd Place Teams. 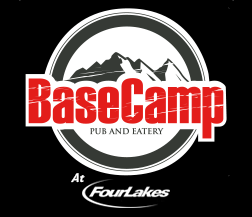 Email basecampmarketing1@gmail.com to reserve your table! Dress in a Onesie and receive a Free shot on us!